Northport Middle Grades Students Hold Funeral for “Dead” Words! 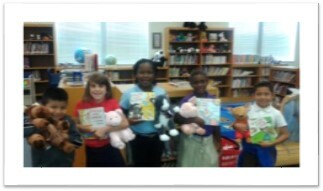 The newest additions to the WCE library, Reading Pals, thanks to a generous donation from a PSL resident, Samantha Folk. On behalf of all Wildcats, our second graders thank you, Noe Rodriguez, Brianna Perrigin, Kammaria Grant, Mary Hills, and Adrian Lopez-Ardiano. Northport Students Welcome “Joe the Biker” and His Message of Empowerment! On September 26, 2015 , a good time was had by all at the Superplay USA! The teams put on their neon attire and did some cosmic bowling, all in good fun to raise money for Big Brothers Big Sisters.